Farmhouse Eleonora is located at the famouse Grosetta - Maremma area. This recently restored 18th century ex granary is a spacious and airy farmhouse located amongst the picturesque Tuscan countryside of old pine forest, typical of this area. Popularly known as the cowboy area however it also has a magnificent coastline and crystal waters, many of florence`s nobels spend their summers here . The owners have taken utmost care in restoring this granary to a beautiful farmhouse that could acoomodate a group of up to 11 people. The farmhouse has a beautiful garden and a spacious and well furnished patio over looking the pine trees forest making it a relaxing and peaceful setting for enjoying al frescoe dining. Villa Gilda is composed into two floors and has eight bedrooms in total, with a sleeping capacity of up to 16 members. It has 8 bathrooms in total. A perfect country view abode, it is composed of three small apartments, inclusive of Tosca, Mimi and Voiletta apartments that flood with modern amenities including Fireplace, Heating, and Parking. While the Tosca and Mimì apartments originally derived from the tower are in the ground and the first floor, the Violetta is totally an independent suite that overlooks the landscape of Florence. They also come along with accessories together with DVD, Refrigerator, Internet, Microwave Oven, Satellite Connection, TV and Washing Machine. Not just that! Some other activities that are waiting to excite you further are Private pool and wine tasting! There is no good time to book Villa Gilda as your holiday rental, start your booking right now! On entering the Farmhouse you will find a large entrance hall with living area and dining area, a kitchenette inside a wardrobe that can be used to prepare meals on the ground floor. On the first floor there is a large living room that is fully furnished and with ceiling fans, a well equipped kitchen and a fire place, 2 double bedrooms with en-suite bathroom each (one with bathtub, the other with bathtub and shower cabin), a twin and a triple bedroom and a third bathroom (bathtub). There is another bedroom with bunk beds perfect for children. This is located beside the kitchen. A family chapel is located at the garden. There is a little path behind this chapel that leads through the pine woods to the pool. The garden & the pool are well maintained and equipped with umbrellas, sun beds and deck chairs. At just 2 km from the farmhouse there is a small village called Braccagni with some groceries, supermarket, a bakery and a butcher. 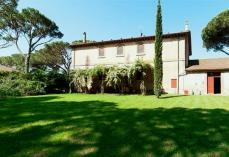 Farmhouse Eleonora is 6 Kms from Grosseto , 1 hour from Siena and 1.5 hours from Rome and from Florence. The coast is just 20 minutes drive. Bikes can be rented in Grosetto, 6kms away . Ottile and Craig Jun 20, 2013 18:06 Thank you for the lovely memories! Tuscany and Granary are family in our hearts! Robert and Nina Jun 20, 2013 18:06 Thank you so much for the wonderful time in Granary. we really wish we could come here every summer to make our kids affectionate to a place and people that have been like family to us!